WEDDING TIP #2: PHOTOGRAPHY RECOMMENDS: DONT WEAR A BRA TH - ProudMummy.com the Web's Community for Mums. 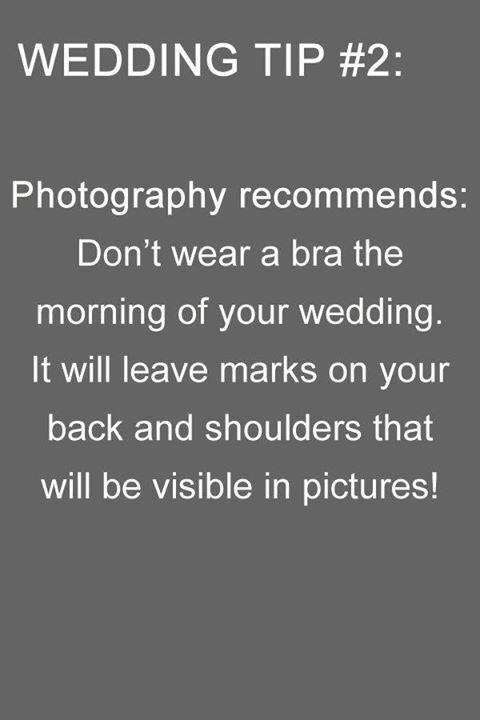 WEDDING TIP #2: PHOTOGRAPHY RECOMMENDS: DON'T WEAR A BRA THE MORNING OF YOUR WEDDING. IT WILL LEAVE MARKS ON YOUR BACK AND SHOULDERS THAT WILL BE VISIBLE IN PICTURES!